develop a love of reading and simply . . . to just have fun. Paws with Love is a non-profit group of volunteer handlers and their therapy dogs. Their mission is to provide comfort and companionship by sharing their therapy dogs with schools, hospitals, nursing homes and other institutions with needs. They provide a reading program called "Reading with Jake" which allows readers to engage in a one on one, non-judgemental atmosphere in which to read aloud. 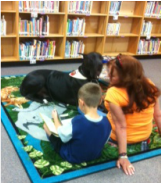 Caleb is one of the therapy dogs in the Reading with Jake program. 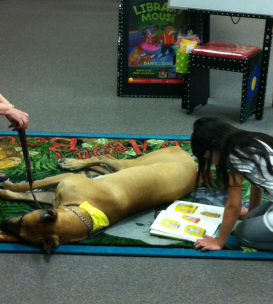 He listens as a student reads to him. Hi, my name is Trooper and I am a certified therapy dog with Paws With Love. I come to Ridgecrest on Mondays and listen to students read. Jennifer enjoys reading to Gunner and I don't think Gunner is having a problem with this either! Trooper is a therapy dog for Paws for Love. He comes once a week to listen to the students read. 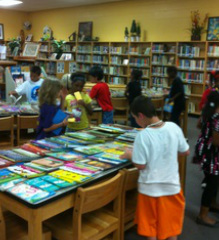 The Ridgecrest library has two bookfairs each school year to raise funds for new books. The needs of the teachers, students, and staff are considered when books and materials are purchased. Book Fairs are how we fundraise for the library. We receive no other funds. There are always plenty of books and other products at a Scholastic Book Fair. 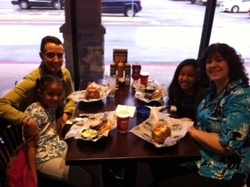 Students enjoy shopping, winning prizes and supporting their library. How can students apply 'being green?' How about participating in a Book Swap? Twice a year the library hosts a book swap for students to bring gently used or new books to trade for books that others have brought. 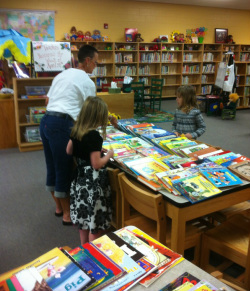 Mrs. Durgin helps two young students choose books at the Book Swap. 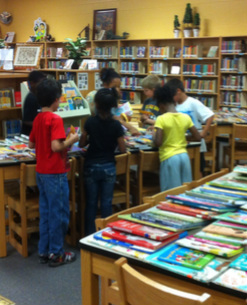 Some children from primary classes are looking for books to trade for the ones they brought. Students are 'Swapping' books at the Ridgecrest Library Book Swap. 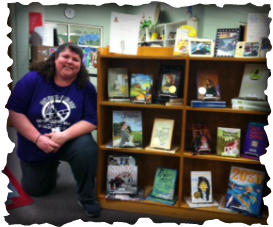 Ms. Katie Long was awarded a grant from the Lawton Foundation for books. She is using them for Battle of the Books. It is a program to motivate students to read. Ms. Long chose to house the books in the library for all students at Ridgecrest to use. 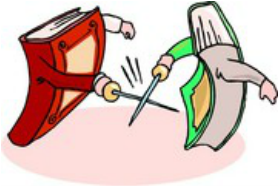 The Battle of the Books programs is nation wide program tailored to best fit the needs of the particular school. Students read books and come together to demonstrate their abilities and test their knowledge of the books they have read.